"When the name of the wading game is durability and comfort, the new Redington Sonic-Pro HD and HDZ waders offer heavy duty construction that will withstand the rowdiest river conditions"
That is the offical party line. Below is a review of these top selling waders from Redington from Sage Pro NZ guide Tony Entwistle. Review of Redington SONIC PRO HD and HDZ wader. Fundamentally I wear waders to keep myself dry while fishing and how well a pair does that for me ultimately determines my final opinion of them. However a number of other factors influence my choices when determining … ‘what will I buy?”. My style of trout fishing shapes many of those demands. Walking long distances each day, wading for long periods without leaving the water, bashing scrub (while doing my best to avoid the ravages of blackberry and gorse), scrambling through boulder fields and forever climbing up banks and even trees, are all part and parcel of a day on the river in my neck of the woods … some may simply refer to it as ‘wader abuse’! After dryness, my feature list then goes; durability, comfort, convenience (aka useful features) and finally cost. In recent seasons I have done a lot of wading in Redington waders. 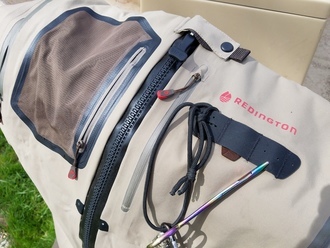 Redington are well know for their rods (second now behind Sage rods in the USA), but they also make some very nice reels and some excellent waders, particularly their Sonic-Pro series. Last season I upgraded to the Sonic-Pro HDZ (zip wader), the latest addition to the Sonic-Pro range and they have ticked all the features on my list. They are tough. The fabric on the HD (Heavy Duty) series has a very dense weave to handle the roughest conditions. They have a heavier-weight material for added protection, on the lower leg where it is susceptible to greater wear, improving both strength and durability. Nothing totally protects waders from the ‘incursions’ of gorse and blackberry, but the HD material has certainly gone a long way towards minimising it for me … after a complete guiding season I had only a couple of small pin-pricks to seal in one leg. The booties are made of 3.5mm neoprene upper with a 4mm base. PK nylon is added to the base of the booties for more abrasion resistance, (a weak point on many cheaper waders), which is a big plus for New Zealand conditions where sand and gravel particles are a constant niggle, even with solid gravel guard protection. While the HDZs are rugged, they are also very comfortable and a pleasure to walk long distances in. At first they may seem a bit bulky, but that’s actually a plus in waders. Many new-chums chose waders that are too neat-a-fit, not leaving enough room for extra clothing on cold days or room enough for lifting the leg or bending over. If your waders are too neat-a-fit you will stretch the fabric and seams, risking the fundamental waterproofness of the waders or even bursting them. The centre front TIZIP zipper on the HDZs is a winner for me. Waterproof zips are now a feature on many top-line waders these days. Anyone who thinks they are a gimmick I suspect hasn’t tried them. I’ve had them on a couple of pairs of waders now and they haven’t failed me. Are they worth the extra $100 over a pair without a zip? ‘Young fellas’ might not need them, but I think the convenience they provide in getting waders on and off and when answering ‘nature’s call’ make it well worth it. The Sonic-Pro HDZs also have some nice added features including a detachable waterproof plastic pouch for cellphones, a water resistant TPU pocket for storing items best kept dry, 3 other pockets (2 internal) for flyboxes, keys etc, an integrated tool dock station on the left chest for attaching nippers, pliers, floatant et al, as well as two fleece lined hand-warmer pockets tucked away inside water-resistant zippers, which is a plus for early-season and winter anglers. The HDZ suspenders are soft, comfortable and easily adjustable. My one criticism of the Sonic-Pro HDZ to-date is their restricted range of sizings. Anglers with long legs or feet larger than US sizing 11, they will have to settle for the regular configuration of the Sonic-Pro HD without the zip. Hopefully Redington will redress this anomaly in the future, for what is their flagship wader. Cost is always a factor for any angler when selecting what waders are best for you. Occasional anglers (unless they simply love good gear), who only fish a few days a year and don’t tackle any rough country will probably settle for a basic set of 3 layer waders. For many these will do an adequate job, but it is unreasonable to expect them to hold up if you wade long hours or eventually do find yourself with some blackberry as company. Where quality and comfort are a prime requirement, Redington’s standard Sonic-Pro is a good choice, but for anglers who need the extra durability, the extra cost of the Sonic-Pro HD or the Sonic-Pro HDZ will be well compensated. Like any other piece of good fishing equipment a good pair of waders helps enhance the overall fishing experience … Redington’s Sonic-Pro HD waders are an excellent choice worth serious consideration. For the Sonic-Pro waders, we use a bi-component fabric. This fabric is a combination of both Hydrophobic (water-hating) and Hydrophilic (water-loving) properties. The Hydrophobic membrane provides waterproof protection while allowing moisture to escape. The Hydrophilic membrane absorbs and transports moisture condensation away from your body/clothing and out through the waterproof layer. This means that while the waterproof laminate fabric is keeping you completely dry from the elements, the membrane within the material itself is working to draw moisture vapor from your body and dissipate it from your system through a process of moisture displacement. This process allows the wader to stay dry on the interior and to breath, therefore, providing the wearer with the highest level of performance and comfort available. This waterproof fabric system has been tested extensively in the lab and in the field and has proven to be our best fabric for use with inclement weather conditions and for keeping you dry in your waders. The Sonic-Pro series waders use 4-Layer nylon fabric with a durable water repellent (DWR) coating to quickly shed water. A heavier-weight, more-dense fabric is used on the lower-leg of each wader style for increased durability in areas which would usually see high wear. This is especially helpful for anglers doing a lot of bushwhacking. The fabric which is used for our Sonic-Pro HDZ and Sonic-Pro HD waders has a very dense weave to stand up to the roughest river conditions. For these waders, we chose superior woven nylon materials and Ultra-Sonic Welded® them to create stitch-less seams which eliminate weak points and unnecessary holes in the shell fabric. We’ve updated the fit for this series to create a very refined fit for all available sizes. Updated bootie neoprene thickness to 3.5MM upper/4MM base and added PK nylon to the base of the booties for additional abrasion resistance and resistance to punctures. Re-patterned seam tape on the neoprene booties to allow for a more comfortable and ergonomic fit at the bridge and the heel of the foot. Loftier/ more dense fleece in the hand-warmer pockets for additional warmth and comfort. Slim wading belt which is compatible with the majority of available pliers and staffs. Large internal stretch-woven pockets for easy access and quick storage of fly boxes and other fishing tools. The Sonic-Pro HDZ Zip wader features a TIZIP center front zipper for superior durability when wading deep and ease of use ‘when nature calls’. The Sonic-Pro HDZ Zip wader includes and Integrated tool dock station at the chest pocket for attaching quick access tools such as nippers, pliers, etc. The Sonic-Pro HDZ Zip wader also includes a water-resistant TPU pocket for storing items that you would be best kept dry.